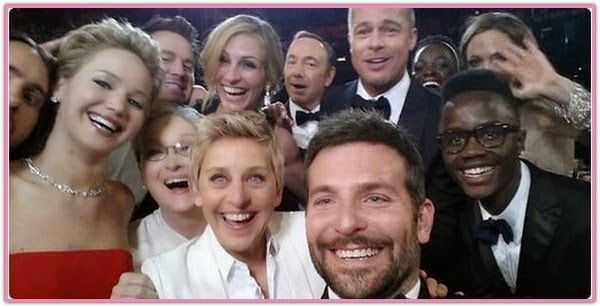 If you read any newspapers or watched any TV this week, there is a good chance you know that Ellen DeGeneres took a “selfie” photo with many stars (and one non-star) at the Academy Awards ceremony. Probably you also know that it hit a record number of views on Twitter, and that she used a Samsung phone. In fact, the picture was taken by a Samsung Galaxy Note 3, a so-called phablet because it is a phone so big that it is just a little smaller than a Tablet. As an article in Wall Street Journal pointed out, this was a product placement. Samsung had bought advertising time in the broadcast and a placement event (not hers, actually), and when she planned taking selfies the broadcaster ABC suggested she use the Samsung. We are getting used to product placements now as a way of more or less subtly influencing us. If you watch music videos, you have probably noticed the odd-looking pill-shaped music player that often appears in them. The advertising industry is currently wondering how much product placement can be done before it really starts annoying people, but for now it is seen as a useful collaboration. The Samsung placement is especially interesting because there are more interesting kinds of collaboration inside that phone, and involving Samsung in general. First, we need to recognize that this is overall a Samsung innovation: it leads the phablet market because they were the first to market such a large phone, and other phone makers thought the size was so unpractical that it took nearly a year of market success to convince them that this was a viable market. But capable as Samsung may be, it cannot make a phone like that using Samsung parts. Samsung makes the screen, which has a 1920 x 1080 density, the same as the setting of the display that I am using now. (And, more than the screen of my laptop can show. . . ) But inside the phone, the makers of parts is a long list including Qualcomm, Wacom, Murata, Maxim, Broadcom, Avago, Silicon Image, Micron, and Audience. Phone makers typically put together devices from many parts suppliers, so this is not completely unusual: an iPhone would also have many parts makers, especially because Apple knows less about hardware manufacturing than Samsung does. But the key point is that the parts of a pioneering phone cannot just be ordered off the shelf, they involve collaboration between the phone maker and the part makers. It is through a large set of alliances and informal collaborations and much practice in making them work well that Samsung is able to put together innovative phablets. For me, part of the fun behind the Oscar Selfies news is that it involved Samsung, a company we are using as an example of skills in using alliances in the book Network Advantage. Having Ellen DeGeneres do nice Selfies is the rest of the fun: To me, the combination of Ellen and fun photography is hard to beat. Greve, Henrich R., Timothy J. Rowley,and Andrew V. Shipilov. 2014. Network Advantage: How to Unlock Value from your Alliances and Partnerships. San Francisco: Jossey-Bass. Vranica, Susan. 2014. Behind the Preplanned Oscar Selfie: Samsung's Ad Strategy. Wall Street Journal, March 3, 2014.